"New mixed-use tower planned for Bryant Park"
The landmarks committee of Community Board 5 last night approved by a vote of 6 to 2 a resolution that, pending research into prior plans involving the site, that endorses a plan, which must be approved by the Landmarks Preservation Commission, for a 31-story, mixed-use tower designed by Morris Adjmi at 14 West 40th Street facing Bryant Park. The limestone-and-glass tower will have about 150 hotel rooms and about 64 residential condominium apartments. The proposal seeks to use a restoration plan for the former Knox Hat Building that had been approved in 1994 when the Republic National Bank intended to develop this long-vacant site, which extends through to 39th Street. The bank had developed the large office tower directly south of the Knox Hat Building in 1981 and at that time received a building bonus for agreeing to maintain the Knox Hat Building, which was incorporated into its new building program at the site, in good condition. The 1994 plan would have permitted the bank to seek various building waivers, but not increases in bulk, for the new building in return for a major restoration program for the Knox Hart Building, but the bank, which is now part of HSBC, decided not to proceed with the new building and therefore did not start the restoration program. Joyce Matz, co-chair of the landmarks committee of Board 5, suggested that the 1981 new building benefited from its incorporation of the Knox Hat Building by being able to build a larger structure and she questioned whether the new owner of the undeveloped site, 40th St. Partners LLC, was trying to reuse the same benefits. Historical preservation consultant William Higgins assured Ms. Matz that was not the case, but the committee passed its resolution conditioned on verifying that claim. The new building would continue the “saw-tooth” street-wall of 40th Street between Fifth Avenue and the Avenue of the Americas, which is punctuated by several tall buildings. Mr. Adjmi said he designed a small west wing of the new-foot-high tower to continue that up-and-down geometry of the street-wall. The new building, which is directly south of the New York Public Library would have a frontage of 20 feet on 39th Street, but 102 feet on 40th Street. Mr. Adjmi said that the new, 338-foot-high tower will have the same square footage as the 220-foot-high plan in 1991. The top of the new tower, Mr. Adjmi, whose other projects include 345 West 14th Street, 450 West 14th Street, and 40 Ganesvoort Street, said, would be illuminated at night and have its rooftop mechanical spaces enclosed in glass behind a loggia. The new tower would be a couple of doors to the west of the 29-story tower at 450 Fifth Avenue that was erected by the Republic National Bank in 1985 and designed by Eli Attia with a staggered north fa&#231;ade that wraps around the former Knox Hat Building. The Knox building was designed by John H. Duncan in 1902 and sensitively remodeled into a bank building by Kahn & Jacobs in 1965. Mr. Higgins said that the restoration of the former Knox building will recreate a curved glass entrance marquee on Fifth Avenue, replace a missing cast-iron railing on a cornice, replace non-original multi-pane windows with single-pane windows, make various needed repairs, but retain the non-original storefront configuration on 40th Street because, he said, it is bettered centered to the upper fa&#231;ade. Recently, a plan to convert the former Rogers Peet Building on the northeast corner of Fifth Avenue and 41st Street to condominiums was abandoned and the property sold to Global Hyatt, which plans to convert it to a hotel and some condominium apartments, and the Durst Organization is currently building a major new skyscraper on the northwest corner of 42nd Street and the Avenue of the Americas. Last edited by londonlawyer; November 1st, 2006 at 05:25 PM. More mediocrity for New York! Horrible rendering, but it sounds promising in the article. What's there now? An empty lot? ... What's there now? An empty lot? I believe that this will be built on the empty lot on that block. Good. Adjmi's done some quality work. The proportions look fine, and limestone/glass is very appropriate here. Looks like an acceptable filler. I'm not familiar with his other projects. Can you post images? I think it's good. I like how he decided a narrower, taller tower would be better on this block....and he's right, the block is a great looking streetscape. I'm sure the details will be good as well. I had no idea there was an empty lot facing the park! Thanks. I really like this one. Yeah I am so happy that empty lot will totally be gone! Finally! It will drive me crazy everytime I passed by this location! I always though it had such a potential. But yet I never heard anyting about some development here. Till now! Well about the desing I don't think is going to look too memorable. Hoepfully I see a better rendering. A disappointing design for such a prominent site. Build something much taller, or much more elaborately designed, or leave the site until better ideas/developers come along. The Landmarks Preservation Commission held a hearing Tuesday night on the design of a proposed, 31-story, mixed-use tower at 14 West 40th Street. The proposal seeks to use a restoration plan for the former Knox Hat Building that had been approved in 1994 when the Republic National Bank intended to develop this long-vacant site, which extends through to 39th Street. The bank had developed the large office tower directly south of the Knox Hat Building in 1981 and at that time received a building bonus for agreeing to maintain the Knox Hat Building, which was incorporated into its new building program at the site, in good condition. The 1994 plan would have permitted the bank to seek various building waivers, but not increases in bulk, for the new building in return for a major restoration program for the Knox Hart Building, but the bank, which is now part of HSBC, decided not to proceed with the new building and therefore did not start the restoration program. 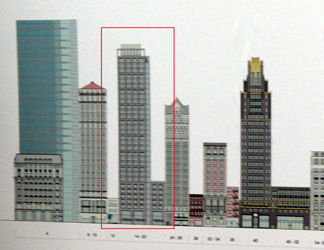 Morris Adjmi, the project's architect, told the commission that the proposed building is a transition between the taller HSBC (formerly Republic Bank of New York) tower that wraps around the Knox Building, and the American Radiator Building, now the Bryant Park Hotel, further west on 40th Street. 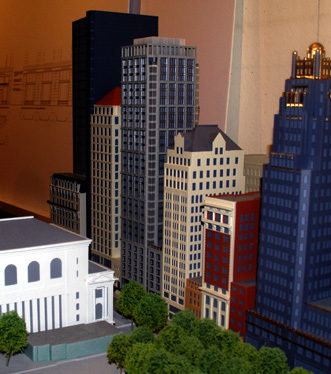 Tthe proposed building is across 40th Street from the landmark New York Public Library. Commissioner Stephen Byrns noted that the proposed tower is mostly "free-standing," which he said was "one of the best aspects" of the building on this "up-and-down" block, "one of the more remarkable streets in New York," but he said he was "a little underwhelmed" by the design, which he felt was "a little tall" and "could be more elegant." Jan Pokorny, another commissioner, however, said he felt "good" about the design, which he described as "elegant" and "first-rate." Commissioner Margery Perlmutter said that the proposed building was "not too tall." The proposed, limestone-clad building has a "punched" fenestration pattern that recesses windows more than a foot and the window openings are framed in stainless steel on the lower floors and aluminum on the upper floors. The bulkhead at the top of the building is surrounded by a wide "fence." A statement from the Historic Districts Council maintained that the design was inappropriate and not harmonious with the nearby Knox Building or other Beaux Arts buildings on the block. Commission chairman Robert Tierney asked the applicant to work with the commission's staff to refine the design and then return. The tower, which would have some corner windows, will have 150 hotel rooms and 64 residential condominium apartments. The top of the new tower, Mr. Adjmi, whose other projects include 345 West 14th Street, 450 West 14th Street, and 40 Ganesvoort Street, said, would be illuminated at nigh. The new tower would be a couple of doors to the west of the 29-story tower at 450 Fifth Avenue that was erected by the Republic National Bank in 1985 and designed by Eli Attia with a staggered north fa¿ade that wraps around the former Knox Hat Building. The Knox building was designed by John H. Duncan in 1902 and sensitively remodeled into a bank building by Kahn & Jacobs in 1965. The proposed restoration of the former Knox building will recreate a curved glass entrance marquee on Fifth Avenue, replace a missing cast-iron railing on a cornice, replace non-original multi-pane windows with single-pane windows, make various needed repairs, but retain the non-original storefront configuration on 40th Street because, he said, it is bettered centered to the upper fa¿ade. Several commissioners agreed retaining the anon-aligned storefront facades was preferable. The new tower will be known as "The View at Bryant Park" and is a project of the 40th Street Development LLC, which is in contract to purchase the property from HSBC Bank. Copyright © 1994-2007 CITY REALTY.COM INC. I thought of these ladies when I saw the thread title.